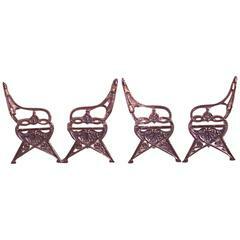 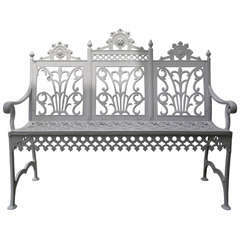 Victorian reticulated garden bench features cast iron construction in grape and leaf pattern and seated on cabriole legs terminating in stylized paw feet garden table, painted white, 20th century. 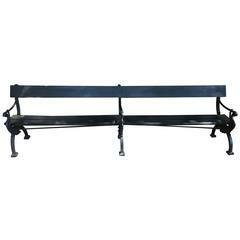 Measures: 27" H x 21" W x 16" D, 15" seat height. 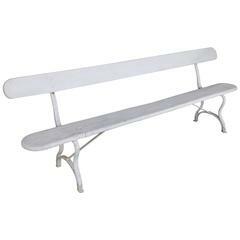 Adirondack Old Hickory School hand-carved bench features slab wood seat with mortise and tenon legs, circa 1940 Measures - 19" H x 26" W x 12" D.
With pierced back, seat and seat rail. 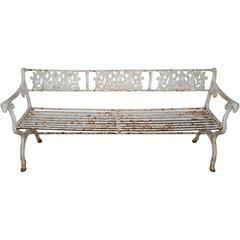 A beautiful French cast iron late 19th century bench with replaced oak planks.